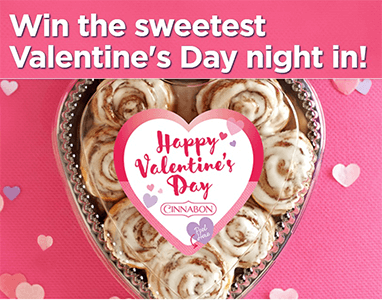 Enter for a chance to win the Cinnabon Valentine’s Day Sweepstakes! 1,000 Winners! Ends Sunday, February 10, 2019 11:59pm EST, to U.S. residents 18 years and older. Limit one (1) Entry per Entrant. Winners will be notified via email by Monday, February 11, 2019.